My only favorite egg recipe from the childhood. I love to have it with chapati. It is easy and quick to prepare. Heat oil in a kadhai and temper mustard seeds. 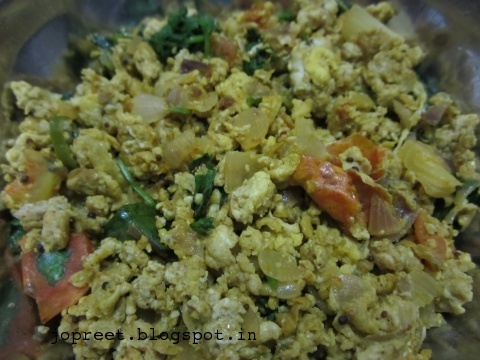 Add curry leaves, chopped green chillies and chopped onions. Saute a while. Add chopped tomatoes. Add turmeric powder and coriander powder. Mix well and break the eggs. Scramble the eggs and add salt to taste. 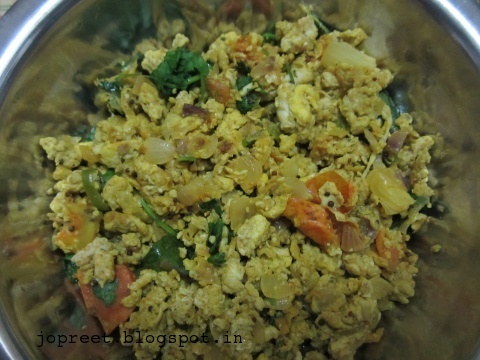 Cook it for 5-10 mins and garnish with chopped coriander. Serve hot with chapati or roti.